Tutorial 33. 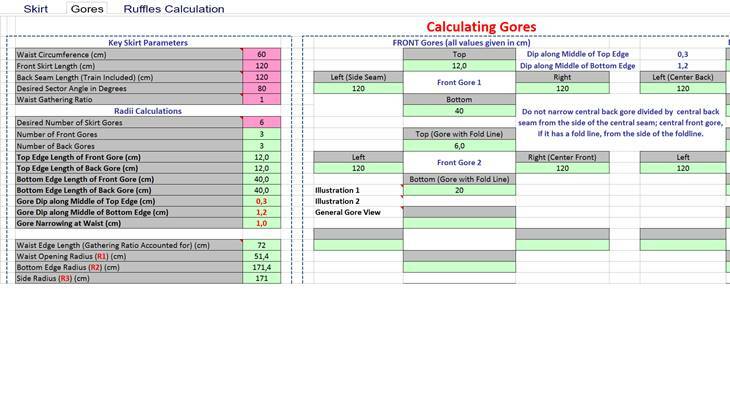 Calculation and construction of a skirt gore. Tutorial 34. Sewing of the base skirt. Tutorial 35. Joining methods of the corset and the skirt. Tutorial 36. Embroidery of the decorative bow (base). Tutorial 37. Embroidery of the bow. Tutorial 38. Embroidery of the belt. Tutorial 39. Embroidery of the lace fragment. Tutorial 40. Creating the lace skirt for the dress. Tutorial 41. Bonus #1. Method of creation of individual padding for skirt fullness. Tutorial 42. Drafting of padding pattern for the skirt. Tutorial 43. Cutting of padding. Tutorial 44. Padding pieces stitching. Tutorial 45. Covering narrow bones with fabric. Tutorial 46. Stitching of bones and pencil-edges to padding. Tutorial 47. Internal part of padding. Tutorial 48. Decoration of padding. Tutorial 49. Pattern for cutting and sewing of the detachable skirt. Tutorial 50. Peculiarities of stitching the soft Rigilene bones to mesh fabric. Tutorial 51. Joining the detachable skirt. Tutorial 52. The belt for the detachable skirt. Tutorial 53. Making the bow from embroidered elements. Tutorial 54. Preparation for final decoration of the top. Tutorial 55. Decoration of the top. Tutorial 56. Joining the top to the dress. Tutorial 57. Conclusion of the course. Tutorial 58. Bonus #2. The drafting of crinoline with ruffles according to the calculation table. Now we start working on our skirt. We need to draft a pattern of the skirt. I suggest sewing a six-gore bell-shaped skirt. 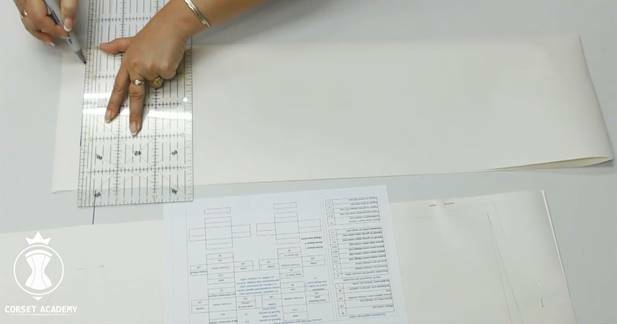 In order to calculate the sizes of a gore it is necessary to use the tables of automatic calculations attached to this course. I suggest opening the table with fixed parameters and make calculations based on hem length. The length of hem is based on the amount of the available lace fabric. I bought 3 m of lace fabric and I used 0.6m for the corset. Thus, I have 2.4m of lace fabric and I think that the hem length should be 240cm. 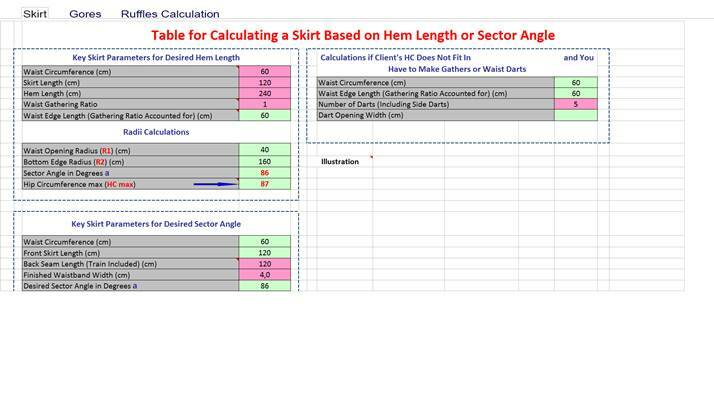 So, we open the skirt tab of the table and specify all necessary measurements and parameters. Other parameters are not important now. Let us have a look at the maximal hip circumference line in the table and we can see the measurement is 87 cm. Thus, according to our parameters the maximal hip circumference is significantly less than our client’s measurement. Her hip circumference is 92 cm. Thus, we need to select such coefficient of waist gathering that the hip circumference of my client would be within the range of the maximal hip circumference calculated according to our parameters. I will use coefficient of 1.2 for the waist gathering. The maximal hip circumference is significantly increased and equal to 97 cm, which is more than the hip circumference of my client. Please pay attention that in the right table now we have the parameters of darts to narrow skirt and these darts can help to make the waist circumference equal to the measurements of the client. The darts intake is 2.4 cm. In the right table you can set the amount of darts. Preliminarily I specify 5 darts, although we should not be thinking about the exact number of darts at this stage of calculation. Now I go to the Gores tab of our table. We set the desired number of gores (6 gores in our case) and receive the calculations for drafting the gore. Narrowing of gore at the waistline is 1cm. Thus, in order to get a waist circumference of our client equal to 60cm we need to narrow every gore by 1 cm from each side. The inclination of the upper center of gore is 3 mm and the inclination of the bottom center of gore is 1.2 cm. Width of the upper edge of gore is 12 cm and the bottom edge is 40 cm. Length of gore from both sides is 120cm and it is the length of skirt. Besides the table made calculations of all measurements for the back half of gore and the central gore panel with fold as follows: width of the upper part is 6 cm, width of the bottom is 20 cm and length of gore is 120 cm from both sides. Now we start drafting the pattern of the skirt. 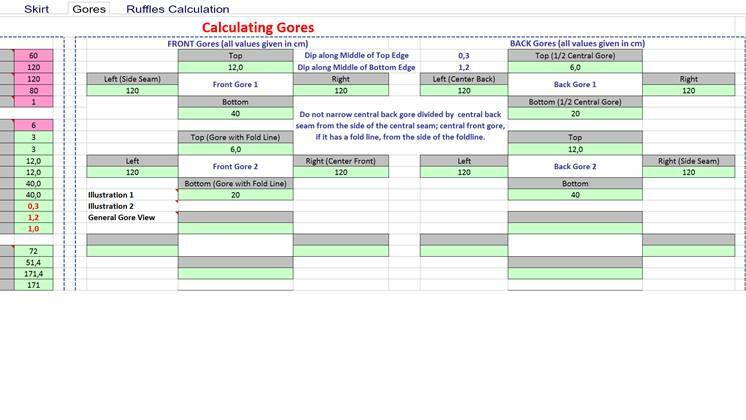 In fact, a gore based on all calculated measurements is drafted very simply. According to your questions I understand that the difficulty is related with the inclinations of gore. I will demonstrate how to deal with it. For better illustration I will draft gores at 1:2 scale. Later you will need to draft gores at the actual scale as the standard long gore of a skirt. In order to have all calculations in front of you I recommend printing out the table for reference before the start of pattern drafting. As all 6 gores are similar I need to draft one pattern of gore with a fold. We fold in half the paper sheet and in the lower part we make a straight line (1) perpendicular to the fold. If you need to have different gores for your skirt, for instance, for a skirt with train, the drafting will be different, but the method remains the same. We continue drafting the gore pattern. I measure down 1.2 cm from the line (1) along fold, which is equal to inclination of the bottom center, and draw a line (2). I measure up 120 cm, which is the length of skirt, from line (2) and draw a line (3). I measure up 0.3cm, which is equal to inclination along the upper center, and draw a line (4). From fold along the line (4) I measure 6 cm or the half of the upper width of gore (point A) and along line (1) I measure 20 cm or the half of the lower width of gore (point A 1). I join the point A and A1 with a straight line. Length of the A-A1 line should be 120 cm. Then I draw a curved line from point A to line (3) for roundness in the upper edge of gore and I draw a curved line from point A1 to line (2) for roundness along the bottom. Now we need to make gore narrowing to the hip line. Let us propose that the hip line is 20 cm below the upper line. I measure 20 cm from point A along line A-A1 (point A2). The narrowing starts from point A2. I measure 1 cm or narrowing measurement (point A3) from point A and join points A3 and A2. Now we need to add seam allowances along all cuts and cut the pattern out along seam allowance lines. I strongly recommend pinning the paper sheet with a fold, otherwise, while cutting off such big patterns you may end up with distortions. Thus, we have drafted the pattern for the face and the lining of the skirt of our dress, which will be covered with the lace fabric.